Give your iPhone 5, 5S or SE some personality with a personalised full wrap hard case. A case can be so much more than just protection. A personalised hard case with your photo wrapped all around the back of the case. The full wrap iPhone 5(S) or SE cases from GoCustomized are a unique, hard plastic phone case which protects the sides and back of your device from scratches and dents. What makes this case extra special, is that your design is printed on the entire phone case. That means both the front and sides are covered. This gives your mobile device a unique look. We use only the best materials in both the case and the print. Each iPhone 5(S) or SE case is made of a durable plastic and we use nothing but the best scratch resistant ink. Use any of your favourite photos to design the perfect phone case. 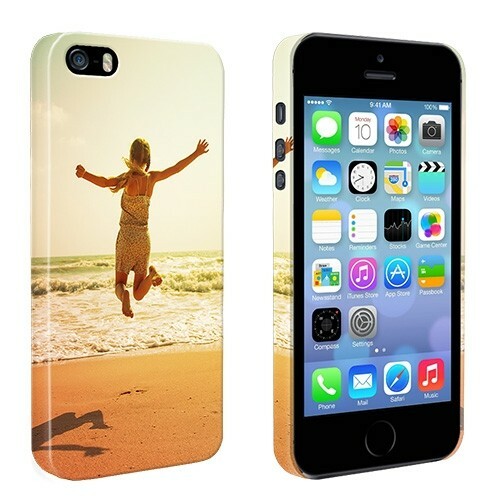 Looking for something else, check out our wide range of Personalised iPhone 5S cases here! GoCustomized has developed a special design module which gives you all the tools you need to make the perfect personalised phone case. You start by uploading an image either from your PC, tablet or smartphone. In addition you can upload images straight from your Facebook and Instagram account using our social media upload module. Once you have the perfect image, resize and reshape how to please. Add a little personal quote or text using our text module. There are plenty of fonts and colours to choose from. Happy with your design? Order away so we can get started making your case! Once your order has been received, one of our production specialists will ensure everything is in order and your design will result in the perfect case. Should they find a flaw in your design that would cause a bad end result, they will contact you about it immediately. Your iPhone 5(S) or SE hard case will be graved with the finest scratch resistant ink in the form of your design. We ensure that your case is on its way to you within 24 hours of purchase!